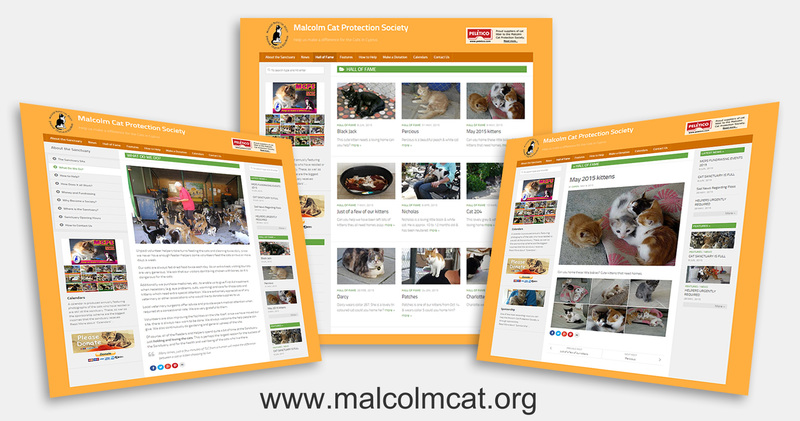 A new website for the Malcolm Cat Protection Society, it’s brighter and better than before and it’s also mobile-friendly! Over the years the helpers at the sanctuary had done a tremendous job adding news items, features and hall of fame entries to the old site and I’ve been able to bring all that content across to the new website but presented in a snazzier way. Photos from the News and Features sections were only saved in low quality on the old website so many of them, although bigger now, will appear a bit blocky or fuzzy. Visit the website: www.malcolmcat.org (opens in new tab/window). The new website is developed using WordPress. This is a content management system originally created for ‘blogging’ but has since developed into a powerful website creation tool which is constantly developed and upgraded to keep it secure and in-line with new technologies. WordPress “out of the box” is nothing special so my task was to find an appropriate theme, customise the design, choose and configure the right add-ons and move all the content from the old website to the new one. With over 700 articles and photos that was quite a lot of work! I love cats and providing the websites for the sanctuary is something I am able to do by way of volunteering. The website has raised awareness of what the sanctuary does which has led to more donations, support and offers of help that have enabled them to keep doing what they do even through tough times. All of this makes me proud to know that I have helped them make a difference. Previous story Microsoft Hyperlapse on Android. Quick Test.